The fifth man in this case was the front turret gunner in the last truck in the convoy. Even though he initially maintained his innocence, eventually he realized that the way to get out from under prosecutorial scrutiny was to "cooperate" with the Department of Justice. His story turned nearly 180 degrees because, in order to obtain a conviction of the other 4 defendants on "aiding and abetting", this man had to scapegoat himself into saying that every action he took (even legitimate ones) were unwarranted and criminal. This guy told the truth in the beginning - just after the incident - except for owning up to the excessive number of shots he took. He has the right to defend himself, as do the four other men - and all warriors who find themselves under fire. However, the exception with this man is that, over the years and under increasingly heavy pressure from the DOJ, he not only turned on his teammates by accusing them of things they did not do, and blaming them for things he did, but he even turned on himself. The only way the DOJ could bring charges on these men - given there were NO FORENSICS that imputed blame to ANY of them - was to accuse them of "aiding and abetting". In order to do that, you have to establish a crime. The DOJ NEEDED this man's actions to be a crime. By his own admission, he is certainly guilty of not obeying certain rules of engagement or possibly even excessive force. Yet, people intimate with this case still question the number of victims the Iraqi investigators presented to the Americans. Thus, even his actions are questionable as actual "crime." The DOJ, however, convinced him they would help him down the road if he not only threw the other men under the bus, but threw himself there as well. They even asked him to say the names of the people he shot. This is something one cannot know while under fire. He did not know the victims were a man and his mother. No one did. But the DOJ had him testify at that level of detail over and over again, hammering home that there was, indeed, a crime. Because without a crime, there is no aiding and abetting. But before too much sympathy is gained for him, you need to examine his story in its totality. Upon questioning during the proceedings, he admitted in court that he had lied about not having been previously diagnosed with PTSD prior to applying with Blackwater, because he knew it would prevent his employment. Oh, but it doesn't stop there. According to his former co-workers, he was not well liked or well trusted during the selection process and received numerous poor peer evaluations. He did not have a good reputation with his colleagues either personally or professionally. In Nisur Square, in Baghdad, Iraq, on September 16, 2007, however, NOT ONE SINGLE teammate anticipated, expected, or abetted this man's inappropriate actions. The other 4 men were experienced military veterans. In such a scene as was the traffic circle, NOT ONE SINGLE ONE OF THEM would have been "drawn into" another teammates indiscriminate firing - for any reason. See their biographies. Get to know them. In court, he testified that, even after he left Blackwater, he lied on a formal document in order to obtain disability insurance. However, this part of his story may have been one more aspect that the DOJ had him twist for their purposes. His disability, he claimed, was based on PTSD occurring after the Nisur Square incident. Given that he was guilty of SOME actions inappropriate for his position, it is quite possible that this was true. But therein lies (no pun intended) the difficulty with the government placing so much trust in a witness like this. His lies and the truth were so interwoven that he simply could not be trusted on any level. Most importantly, according to many of his former teammates' testimony, he has lied repeatedly about his actions on September 16, 2007 and the actions of others both during the investigation and during the trial. 1. You must admit to all of your wrongdoing. Part of the "plea deal" can involve an actual "deal" - you may admit to doing 7 things wrong, but in order to gain your cooperation, they will only hold you accountable to 2 - for example. 2. You must tell the truth. Part of the plea agreement is the requirement that you still tell the whole truth and nothing but the truth from that moment on. 3. You must provide "substantial assistance" to the government. See photo below, for a general definition - but don't be fooled. Although the text says "investigation OR prosecution", the Department of Justice is ALWAYS looking to get a conviction based on any Cooperator's testimony. They will intentionally leave their definition vague so that Cooperators will never be quite sure when they have reached an acceptable level of "substantial assistance". The problem is that this "bartering" system does nothing to foster truth. A cooperator who is desperate to escape consequences believes he will be - and quite often is - rewarded for lying...especially when it comes down to one person's word against another. In the case of this Fifth Man, the events FOLLOWING the plea agreement were egregious. Even after he made the plea deal, he still maintained for another year that he did nothing wrong. Eventually, however, not only did he wholly minimize his own actions on that day, but when testifying and trying to reach that appropriate level of "substantial assistance", this Fifth Man began to fabricate - even on the witness stand - testimony against his teammates. Read further to find out what actions he was responsible for on September 16, 2007, but keep in the back of your mind - he was hoping that all 4 of the other defendants were found guilty (now THAT would be "substantial assistance"), while he literally is hoping for probation. 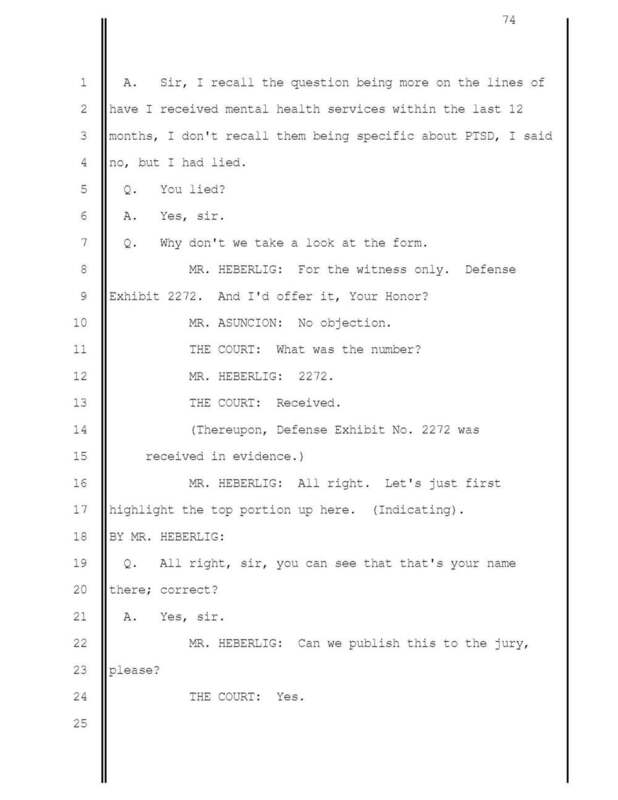 During the course of the trial, multiple former teammates (who had been given immunity in order to testify), testified that he was firing his weapon indiscriminately. One of the government's own witnesses testified that he was "out of control" and another testified that he "was picking out targets and shot at these two [unarmed men]." Yet another government witness testified that he expended "a hundred, hundred plus" bullets that day. 1. Admitted firing three to five shots at the driver of the white Kia after seeing another turret gunner shoot at the Kia and said that he had not seen any holes in the windshield prior to his shots being fired - this is the same alleged victim Nick has been convicted of murdering. Notably, physical evidence backs up his testimony because a fragment matching a bullet from a turret gunner weapon type (which was different from Nick's) was found imbedded in the steering wheel. But, was he charged with any of the crimes to the south of the square? No. One count of attempted manslaughter ("device man"). Although he also testified to shooting the driver of the white Kia after seeing ANOTHER turret gunner shoot, Nick Slatten was convicted of murdering this driver (a conviction that could only happen if Nick fired the first shots, which he clearly did not do), and his teammates Paul Slough, Evan Liberty, and Dustin Heard were found guilty of numerous untrue crimes, even though nothing in the trial testimony indicated that any of his teammates had done anything aside from responding to legitimate perceived threats. It all goes back to the DOJ needing to prove someone in the convoy committed a crime. They used this man mercilessly, eliciting testimony that made sure to establish he had committed a crime, thus enabling them to associate the other four defendants as "aiders and abettors", despite failing to prove the one element necessary for aiding and abetting (see graphic, below). For all the other 4 defendants knew, this man was engaging legitimate targets, just as they were, even if he later was guilty of using excessive force or operating against established rules of engagement. During a firefight, every man is to answer for his own actions. The other 4 defendants were not given that benefit. To this day, NO ONE is 100% sure of how many people were injured in Nisur Square, or of who caused their injuries - although the Department of Justice will disagree. The difference rests in whether or not you find the Iraqi witnesses' testimony credible, and the level of faith you have in the Iraqi investigation, which we now know was spearheaded by a person U.S. intelligence shows has suspected insurgency ties. Ultimately, without forensic evidence and proper investigation, the prosecutors knew there was only one route to conviction - Aiding and Abetting. Look closely at the legal description of Aiding and Abetting, below. Although the chart lists Dustin Heard specifically, the same is true for Evan Liberty and Paul Slough. One must believe that Dustin, Evan and Paul KNEW that the Fifth Man was not only committing some crime, but that they also WANTED him to commit said crime. The odd thing is that the prosecution's theory of the case was that Nick Slatten fired the first shot, for no other reason than to start a firefight. So which person were Dustin, Evan and Paul supposedly "aiding and abetting" - their Cooperator or their accused? Under the applicable legal standards, we know that it could not have been Nick Slatten because Nick’s case, although tried jointly, involved an entirely separate alleged crime that Dustin, Evan, and Paul were not charged with aiding and abetting. However, that is just another critical point that could have easily been lost on the jury since the prosecution was permitted to argue that anyone who fired his weapon in Nisur Square was responsible for the admitted crimes of the Fifth Man.